Croak.it! is a free tool for recording audio and sharing this audio via link. 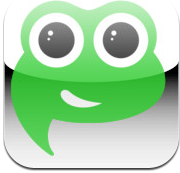 It is available for Android, iOS and on the web… so most anyone can use Croak.it! This is the simplest of tools, simply click, it begins recording something, click to stop recording, and then click to copy or share the link to your audio recording. Easy Peasy! The main feature of this is ease of use. It doesn’t get much simpler than this. The recordings must be 30 seconds or less, so these are really short snippets. FOr each recording you will get a link for that recording. The audio file is saved on their server somewhere “out there”. The interface for the website, the iOS version, the Android app and even the bookmarklet are virtually identical, so very simple for everyone! So what can you do with this app/tool? Well, I was thinking about how simple it would be to make short snippets of audio, create a QR Code or a Chirp and provide audio hints on a math paper, or a bit of foreign language for a student to write, or even a self-paced spelling test! Small, simple, audio recordings could also be like “game show”… record questions about a unit of study and have students scan the link and then their team has to answer that question… I bet there are a thousand ways you can think of using this simple little tool! Please feel encouraged to share your ideas by commenting on this post! iOS app version is compatible with iPhone 3GS, iPhone 4, iPhone 4S, iPhone 5, iPod touch (3rd generation), iPod touch (4th generation), iPod touch (5th generation) and iPad. Requires iOS 4.3 or later. Android app version requires 2.2 and up. Cool beans! This is such a simple interface. Can’t wait to use it with some pre-schoolers.